Battle of Thermopylae (480 B.C.) - Ten years after Marathon, Darius' son, Xerxes, returned to Greece with the intention of conquering the entire peninsula. The warring city-states put aside their differences and united to face the common threat. 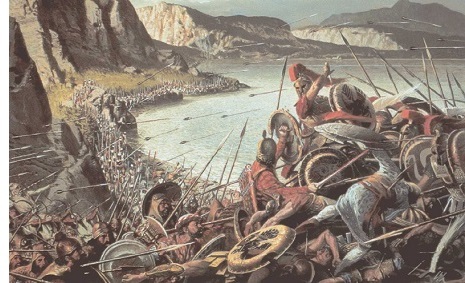 They tried to stop the Persian advance at Thermopylae (which means "hot gates"), but were ultimately defeated. However, the goal was simply to slow the Persians down long enough for the Greeks to prepare for the invasion. At that they succeeded. The battle was famous for the stand the 300 Spartans made against overwhelming odds.